New York Times, Wall Street Journal, and USA Today Bestseller! 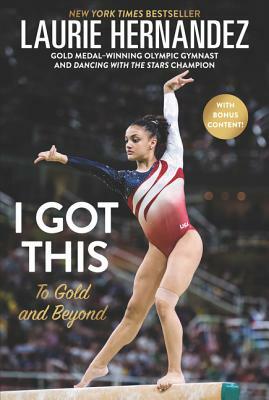 Now in paperback with Laurie's beloved pump-up playlist, favorite movies, top travel tips, best Olympic memories, and more! Poignant and funny, Laurie’s story is about growing up with the dream of becoming an Olympian and what it took to win gold. She talks about her loving family, her rigorous training, her intense sacrifices, and her amazing triumphs. Be prepared to fall in love with and be mesmerized by America’s newest sweetheart all over again. Laurie Hernandez is an American gymnast, an Olympic gold medalist, and the youngest-ever champion on Dancing with the Stars. At the 2016 Olympic Games in Rio, Laurie won silver in the individual balance beam competition and secured gold in the team all-around competition. Laurie started gymnastics at the age of six because she wanted to experience the feeling of flying. She enrolled at Monmouth Gymnastics in New Jersey, where she met her coach, and they became a winning duo. The turning point in Laurie’s career came in 2014, when her progress was stalled due to multiple injuries. She returned stronger than ever by becoming the 2015 US junior national champion. Laurie’s other career highlights include all-around silver, beam gold, and floor exercise bronze at the 2016 US Olympic Trials, and bronze in all-around, floor exercise, beam, and uneven bars at the 2016 national championships. Laurie is known for her dazzling floor exercise routines and for her grace and artistry on the balance beam. And she has been nicknamed “the Human Emoji” for her outgoing facial expressions.